We proudly present to you our 4th Anniversary Party "𝐀𝐁𝐂 𝐆𝐚𝐦𝐞 𝐎𝐧 𝐂𝐡𝐚𝐥𝐥𝐞𝐧𝐠𝐞 𝐑𝐨𝐮𝐧𝐝 𝟒 – 𝐊𝐞𝐬𝐬𝐞𝐧 決戦!" 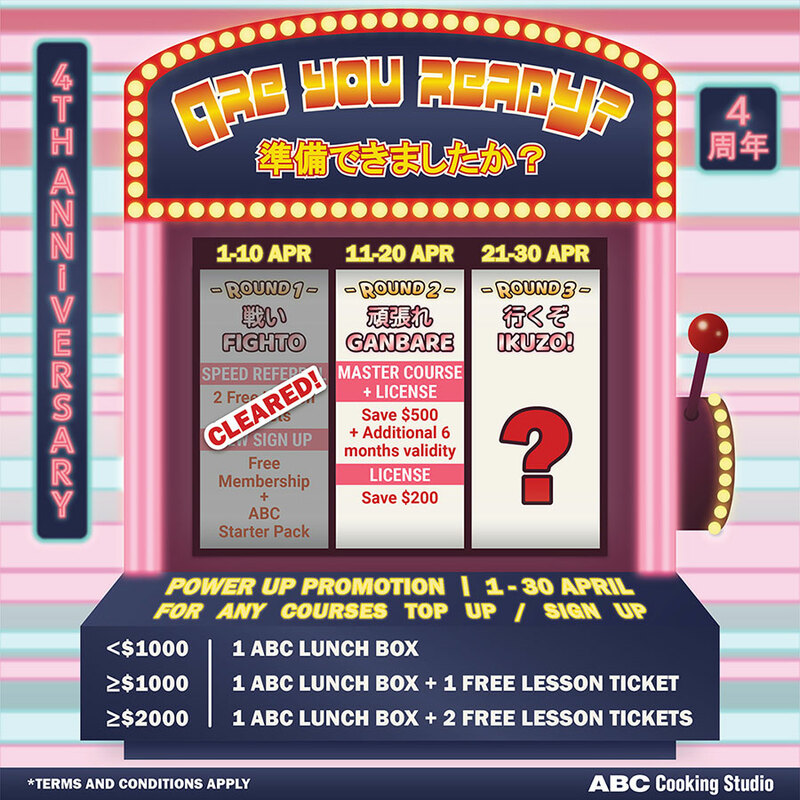 This is not a fight to decide a winner and loser, but to appreciate your support to ABC Cooking Studio these 4 years. 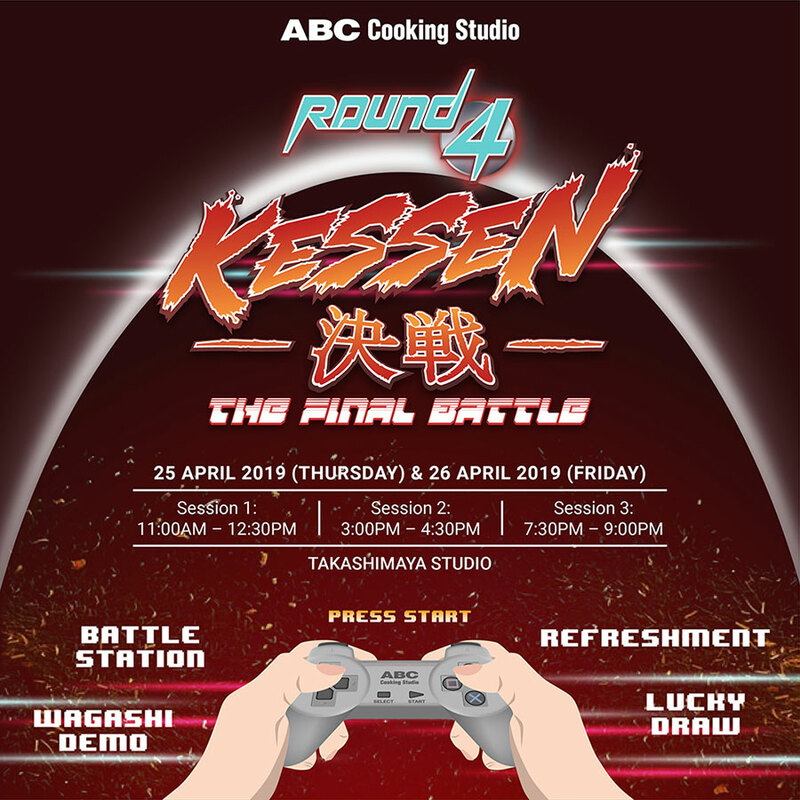 For Round 4 - Kessen 決戦!, we will have special wagashi demo, lucky draw and 𝐁𝐀𝐓𝐓𝐋𝐄 𝐒𝐓𝐀𝐓𝐈𝐎𝐍𝐒 that you will get a chance to compete 𝐖𝐈𝐓𝐇 𝐓𝐇𝐄 𝐈𝐍𝐒𝐓𝐑𝐔𝐂𝐓𝐎𝐑𝐒! Keep your guard up before the registration link is opened on 18th April 2019 (Thu), 10am for each member is as excited for our Anniversary Party as you do. For successful registrants, a confirmation email will be sent to you within an hour. 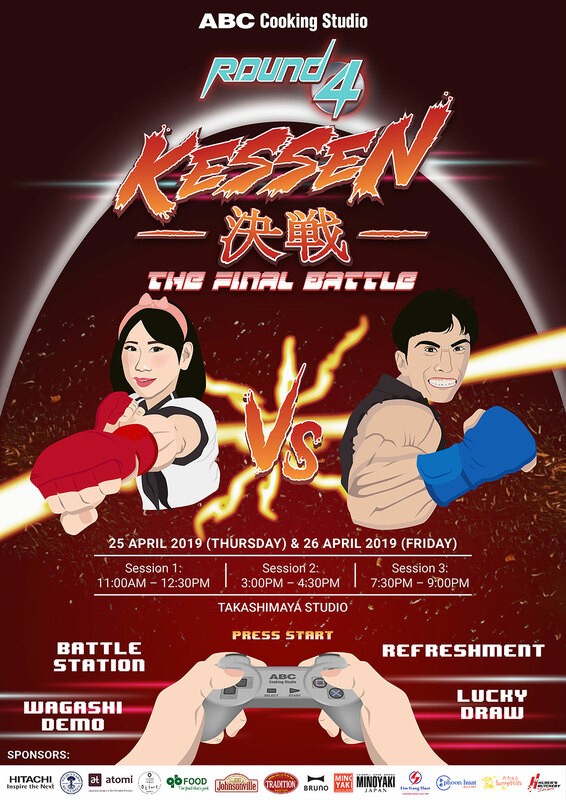 We hope to see you at our Takashimaya Studio on 25th & 26th April 2019! *Members-exclusive event. Each member is allowed to bring a non-member (friend) along. *Registration is based on first-come-first-served basis. No exception will be allowed once the sessions are fully registered. *Only online booking is accepted. Master Course, I choose you! Whether you are a novice or a seasoned baker, we all like to try out as many recipes as we could. Hence, from 11th to 20th April, we will be having an exclusive offer to members who want to take a step further from the basic course. For purchase of both Master course and License, you will enjoy $500 savings and an extension of 6 months! For members who are completing/ have completed Master course, you will enjoy a $200 savings when you purchase ABC license (U.P. $1819). 1. From the base to the decoration, your products will be made entirely from scratch. 3. The ingredients used also varied from the Basic course and Master course. 4. Change your career - Tired of the routine 9 to 5 job? Be a trainer or start an F&B business after obtaining ABC license! 5. Be a true professional in bread & cake. 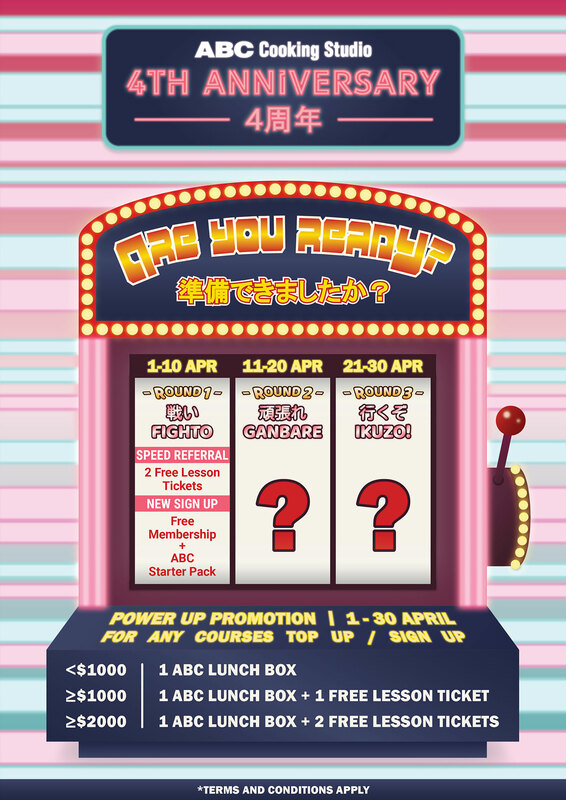 To further boost your level, we have Power Up Promotion for the whole of April. ✔️Simply sign up/ top up any courses/ packages to receive our ABC lunchbox and/ or free lesson tickets. Are you up for the game? Head down to our Takashimaya or Westgate studio before this exclusive deal slipped away! Have you been waiting for this moment? 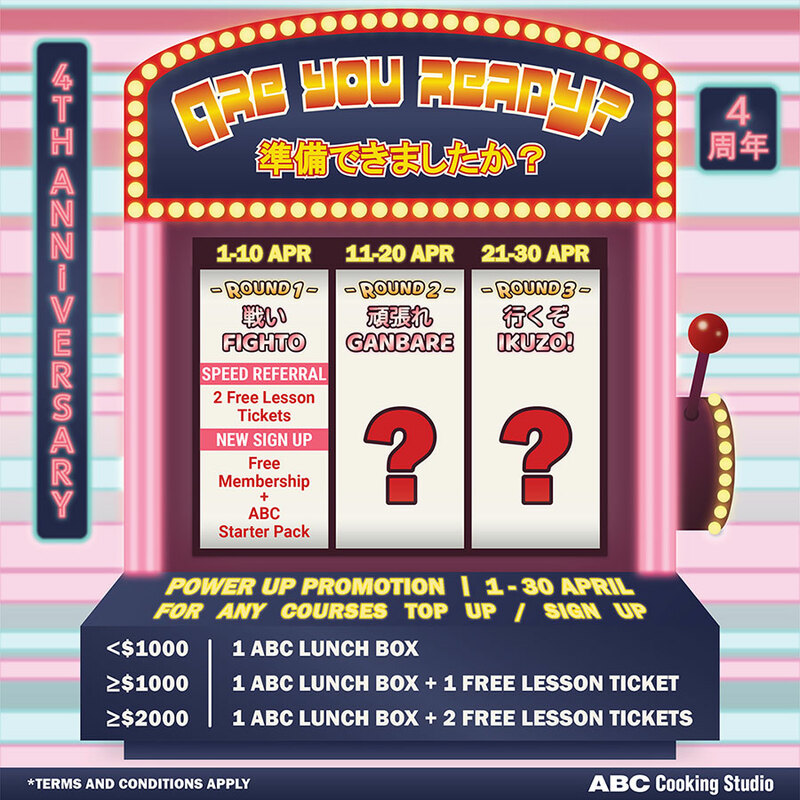 The wait is finally over because we are going to load your April with our Anniversary promotion! As a start, we have Round 1 - Fighto 戦い where you will need to fight against time. Between 1st and 10th Apr, members will get to enjoy 2 free lesson tickets for every successful referral. For every new sign-up, you will enjoy free membership and receive our ABC starter pack. 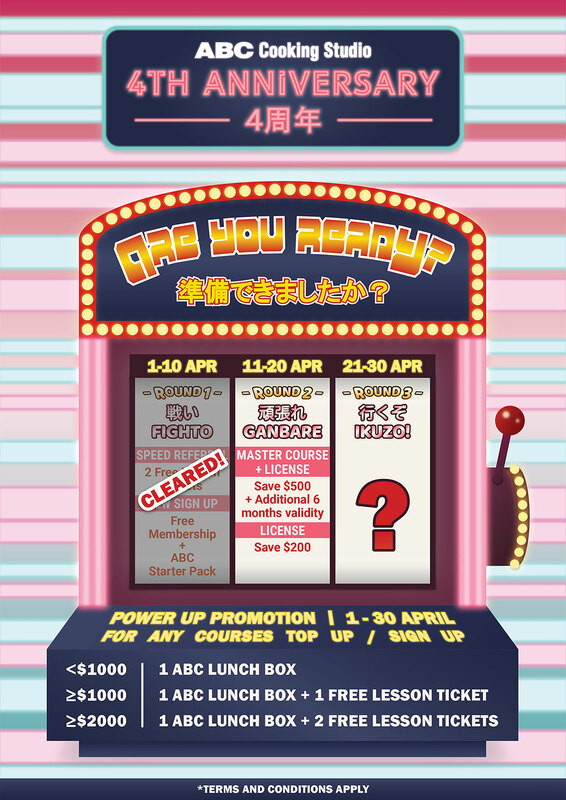 To boost your level, we have Power Up Promotion for the whole of April. As we hope to be more environmentally conscious, you can receive a lunchbox and/or free lesson ticket when you sign up/ top up ANY courses/ packages. We would love to see you bringing back your finished products home with our ABC lunchbox! So, are you ready to take on the challenge? Quickly head down to our Takashimaya or Westgate studios before the time is up! *ABC Starter Pack includes an apron, a wooden utensil set, a lunchbox set. Limited quantity, while stocks last.